A research team led by UCLA electrical engineers has developed a new technique to control the polarization state of a laser that could lead to a new class of powerful, high-quality lasers for use in medical imaging, chemical sensing and detection, or fundamental science research. Think of polarized sunglasses, which help people see more clearly in intense light. Polarizing works by filtering visible light waves to allow only waves that have their electric field pointing in one specific direction to pass through, which reduces brightness and glare. Like brightness and color, polarization is a fundamental property of light that emerges from a laser. The traditional way to control the polarization of a laser was to use a separate component like a polarizer or a waveplate. To change its polarization, the polarizer or waveplate must be physically rotated, a slow process that results in a physically larger laser system. 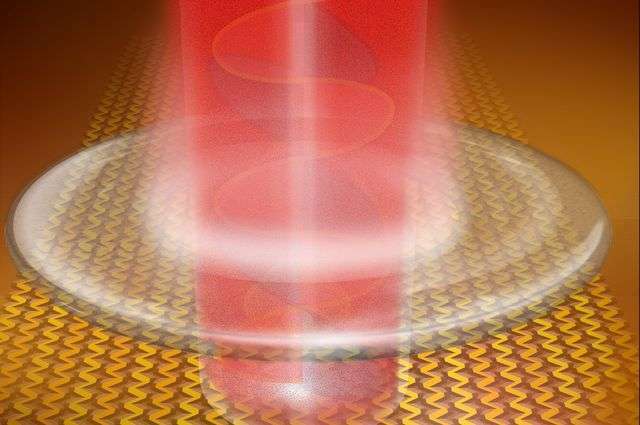 The team from the UCLA Henry Samueli School of Engineering and Applied Science developed a specialized artificial material, a type of "metasurface," that can tune the laser's polarization state purely electronically, without any moving parts. The research was published in Optica. The breakthrough advance was applied to a class of lasers in the terahertz range of frequencies on the electromagnetic spectrum, which lies between microwaves and infrared waves. "While there are a few ways to quickly switch polarization in the visible spectrum, in the terahertz range there is currently a lack of good options," said Benjamin Williams, associate professor of electrical engineering and the principal investigator of the research. "In our approach, the polarization control is built right into the laser itself. This allows a more compact and integrated setup, as well as the possibility for very fast electronic switching of the polarization. Also, our laser efficiently generates the light into the desired polarization state—no laser power is wasted generating light in the wrong polarization." Terahertz radiation penetrates many materials, such as dielectric coatings, paints, foams, plastics, packaging materials, and more without damaging them, Williams said. "So some applications include non-destructive evaluation in industrial settings, or revealing hidden features in the study of art and antiquities," said Williams, who directs the Terahertz Devices and Intersubband Nanostructures Laboratory. "For example, our laser could be used for terahertz imaging, where the addition of polarization contrast may help to uncover additional information in artwork, such as improved edge detection for hidden defects or structures." The work is based on the group's recent development of the world's first vertical-external-cavity surface-emitting laser, or VECSEL, that operates in the terahertz range. Their new metasurface covers an area of 2 square millimeters and has a distinct zigzag pattern of wire antennas running across its surface. An electric current runs through the wires, selectively energizing particular segments of the laser material, which allows a user to change and customize the polarization state as needed.